Michel Temer and Xi Jinping. - Cooperation agreements between CHINA and BRAZIL to continue FIOL's project. A railroad of 1.527km long distance aiming to facilitate de transport of iron ore is threatening local communities along the path. Chinese financing is likely. VALEC is a state enterprise connected to the Ministry of Transports in Brazil. They're building the Ferrovia de Integracão Oeste-Leste (FIOL). The railway is approximately 1500km long, connecting the States of Bahia and Tocantins. The construction process has started in 2011 and the final project's delivery estimated time was 2014. The idea is to drain iron ore production for export through Ilhéus port. Due to the complexity associated with the logistic complex and a combination of several environmental licence processes to make to project happen (private and public ports, mine, and railway), it has been facing challenges to ramp up into operation. It is relevant to state that this project is connected to another one, Pedra de Ferro Mine, managed by BAMIN and also generating several conflicts with the nearby communities. One of the social impacts of the project is the expropriation of families. In July 2011, the first 100 families received indemnifications to leave their homes so the project could advance with construction in these areas. On top of that, Brazilian environmental agency (IBAMA) has interrupted later on that year the project's installation licence due to corruption investigation processes. The railway project is composed of three stretches: (1) From Ilhéus (BA) to Caetité (BA), encompassing 537km; (2) from Caetité (BA) to Barreiras (BA), encompassing 485km; and (3) from Barreiras (BA) to Figueirópolis (TO), encompassing 505km, approximately. Each stretch has several different consortia in charge and the implementation rates are different along the railway project. Comissão Pastoral da Terra (CPT) indicated conflicts due to this project are mostly connected to land (12 conflicts registered) and water (18 conflicts registered) issues. They are happening along the railway construction, encompassing different villages and municipalities and involving traditional communities (indigenous peoples and afrodescendants communities named "quilombolas"), workers and nearby residents. The main impacts are connected to housing damages due the railway construction, the way the resettlement of communities was done, and changes in the river courses. In 2015 CPT coordinated an event aimed at information and experience exchange among the impacted communities. The objective was to improve the awareness among the affected people about the project issues in a systemic way, so they could be able to perform mobilization and network building processes and then confront the project with greater positive outcomes possibilities. In the same year, some of the railways stretch construction sites were stopped, and in Caetité (BA) the stoppage lasted more than two years. Other stretches are also facing delays. In 2016 VALEC reviewed their expropriation rules and the updated version is now on course in place of the previous one (dated from 2010). In March 2017 the public prosecutor officer in charge visited quilombola communities in Bom Jesus da Lapa (BA). 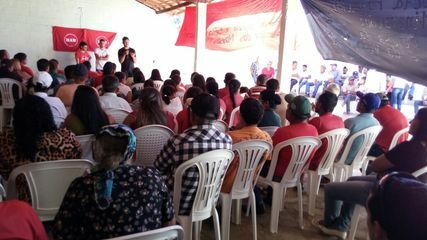 During the meeting water issues, conflicts with FIOL's project, and mobility issues in roads nearby the construction sites were reported by community leaders. In June 2017 VALEC was cited in investigating cases of corruption in Brazil. Later on, in Agust, president Temer started negotiations with Chinese investors to continue FIOL's project. In the same year, the nearby communities in Brejinho das Ametistas (BA) together with MAM, CPT and the rural union have done a popular consultation with more than 100 people to discuss the impacts caused by VALEC and positioned themselves against the project. Project Details Bahia Oeste Railway starts from Figueirópolis (Tocantins state) to Ihéus (Bahia state) encompassing circa of 1500km. The influence area covers 12 municipalities in Tocantins, 34 in Bahia and 1 in Goiás. The main objectives with the railway are, among others: to establish more economic alternatives to long distance loading transportation; favour multimodal options; and to connect the brazilian railway roads. There is an estimation of generating 650 direct jobs per each 100km of building infrastructure and 1950 indirect jobs. The main benefits, among others, would be to reduce transportation costs of grains, alcohol and minerals; increase the agroindustry production in the region; reduce the polluents emission; reduce the accidents rate on the highway roads. In late 2016 it was reported that the Chinese government proposed to Brazil creating a binational state-owned company that would build the 1,527 km West-East Integration Railroad (Fiol), in a model that could be replicated in other Chinese investments in Brazilian rail transport. According to Transportation Minister Maurício Quintella Lessa, the Michel Temer government will study the proposal. Valec, a state-owned company, holds the Fiol concession and has already invested 4 billion reais (1.1 billion euros) in the project. 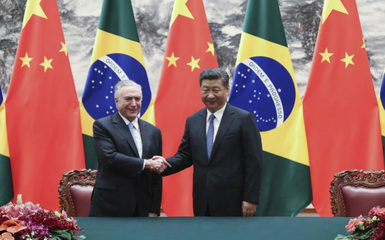 (Source: https://www.railwaypro.com/wp/brazil-china-proposes-binational-company-for-rail-project/). Why? Explain briefly. The project was temporarily suspended but the reasons were not connected to the environmental justice struggle in the region. In 2017, president Temer started negotiations with Chinese investors to continue FIOL's project. News article about the construction stoppage and its consequences to mineral extraction in the region. Preliminar Environmental Impact Assessment Report This document is a preliminary environmental report made in 2008 by VALEC. Report on Economic Assessment The report is a preliminary economic assessment study made by VALEC in 2008. VALEC executive board meeting report The meeting aimed to discuss and decide on displacement processes in the communities around the railway construction in 2016. FERROVIA DE INTEGRAÇÃO OESTE-LESTE: INTEGRAÇÃO SULAMERICANA, PADRÃO DE REPRODUÇÃO DO CAPITAL E CONFLITOS SOCIOAMBIENTAIS The paper analyses FIOL project arguing it estimulates the consolidation of a capital reproduction pattern associated with commodities exports. This pattern tends to generate new tensions and conflicts, especially regarding rural issues. VALEC expropriation regulation The document is from 2016 and is an updated version of the previous one, dated from 2010. Michel Temer and Xi Jinping. Cooperation agreements between CHINA and BRAZIL to continue FIOL's project.